"Athens Airport" redirects here. For other uses, see Athens Airport (disambiguation). Athens International Airport Eleftherios Venizelos (Greek: Διεθνής Αερολιμένας Αθηνών «Ελευθέριος Βενιζέλος», Diethnís Aeroliménas Athinón "Elefthérios Venizélos") (IATA: ATH, ICAO: LGAV), commonly initialized as "AIA", began operation on 28 March 2001 and is the primary international airport that serves the city of Athens and the region of Attica. It is Greece's busiest airport and it serves as the hub and main base of Aegean Airlines as well as other Greek airlines. The airport is currently in Group 2 of Airports Council International (10–25 million) and as of 2018, Athens International is the 27th-busiest airport in Europe. 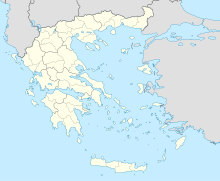 AIA is located between the towns of Markopoulo, Koropi, Spata and Loutsa, about 20 km (12 mi) to the east of central Athens (30 km (19 mi) by road, due to intervening hills). The airport is named after Elefthérios Venizélos, the prominent Cretan political figure and Prime Minister of Greece, who made a significant contribution to the development of Greek aviation and the Hellenic Air Force in the 1930s. As to-date, ownership is divided between the Hellenic Republic (Greek State) and Private Sector in a 55%-45% stake following a PPP scheme for the airport company. Currently, private investors include the Copelouzos Group (5%) and PSP Investments of Canada (40%), following purchase of Hochtief's shares. The airport was constructed to replace the now-closed Athens (Ellinikon) International Airport, as the latter had reached its saturation point with no physical space for further growth. Studies for a new airport had been carried out from as early as the 1970s, with as many as 19 different locations being looked at before an area close to the town of Spata was chosen as suitable. Athens Airport SA, a state-owned company, was established in 1978 to proceed with the plans. However, after delays and slow development, the project was revived in 1991 with the then government launching an international tender for the selection of a build-own-operate-transfer partner for the airport project, with Hochtief of Germany being selected. In 1996, Athens International Airport S.A. (AIA) was established as a Public–private partnership with a 30-year concession agreement. That same year, the €2.1 billion development finally began with an estimated completion date of February 2001. The airport construction was completed five months before schedule, but was delayed opening a month due to surface connections to Attiki Odos not being completed. The airport officially opened on March 28, 2001. The first arrival was Olympic Airways OA424 from Toronto, via Montreal. The second arrival was Olympic Aviation from Kythira which departed Hellenikon Airport earlier and the first departure was a KLM flight to Amsterdam. Its major features include two parallel runways being 4 km (2.5 mi) and 3.8 km (2.4 mi) long respectively. The airport has received approval from the European Aviation Safety Agency and the Federal Aviation Administration for take-offs and landings of the biggest passenger jet worldwide, the A380. The first ever A380 to visit 'Eleftherios Venizelos' Athens International Airport made an emergency landing on 13 April 2011 for emergency medical reasons. The first scheduled A380 flight took place on 26 October 2012 by Emirates. The Greek government-debt crisis reduced the overall passenger traffic of the airport for six consecutive years. Many long-haul airlines outright terminated service to the airport, while others chose to operate on a seasonal basis only, opting to terminate service during the winter months. Moreover, these problems were further exacerbated by the closure of Olympic Airlines, which operated many long-haul flights to and from the airport. In 2013, the airport handled just above 12.5 million passengers, 3.2% fewer than in 2012 and lower by approximately 25% when compared to 2007's traffic, which was the all-time-high at that time. 2014 signaled a strong recovery for the airport's passenger traffic and all statistical figures. More than ten new airlines started new flights to and from Athens. Aegean Airlines strengthened its network by 30% (with many more destinations scheduled for 2015) while Ryanair established a new base in the Athens Airport and added eight destinations. The airport company recorded an increase in passenger traffic in excess of 21% during 2014, reaching 15.1 million passengers, resulted both by new destinations but also by increased capacity offered on established ones. Characteristically, Singapore and Gulf Air resumed flights while Emirates, Etihad Airways and Qatar Airways fly more frequently to/from Athens. Delta Air Lines and American Airlines retained their seasonal schedules to/from USA with even more frequent connectivity. From 2017 onwards, year-round services to Singapore are going to resume after more than five years. Flights are going to be operated by Scoot. According to AIA published statistics, total traffic for 2015 achieved an impressive performance reaching almost 18.1 million passengers, an all-time-record for the airport at that time, increased by 19% on year-over-year basis and by 1.55 million (+9.4%) the previous best, which was the pre-crisis year 2007. In addition, over the same period, aircraft traffic exhibited a solid growth of 14% year-over-year. Moreover, in 2015 a significant rise (+38%) was recorded by transfer passengers, with the international to international transfer traffic marking an impressive increase (+60%) demonstrating the significant enhancement of the Athens airport connectivity. 2016 was a landmark year for the Athens International Airport, both for domestic and international destinations. Annual results reflected a solid performance for a third year in a row fueled by double-digit growth, this time passing the twenty million mark, increased by 10.7% on year-over-year basis. Healthy growth continued in 2017 with the airport showing traffic increase of 8.6% to a total of 21.7 million passengers, yet another all-time record for the Athens airport. During 2018, the airport achieved yet another record high, reporting increased passenger traffic by 11% to more than 24.1 million passengers. Equally, aircraft traffic achieved a new record with a reported annual growth of 10.8% to 217,094 movements. In the second half of June 2018 Emirates added an extra daily flight from its base in Dubai Airport using the Airbus A380 superjumbo, marking the first time the "superjumbo" operated at the airport with a scheduled flight for a long period of time. The A380 service was continued until the end of August 2018. The airport currently has two terminals, the main terminal and the satellite terminal accessible by an underground link from the main terminal. It is designed to be extended in a modular approach over the ensuing years in order to accommodate increases in air travel. These extensions are planned in a six-phase framework. The first (and current) phase allowed the airport to accommodate 26 million passengers per year. When the airport originally opened, the current phase called for a capacity of only 16 million passengers per year; however, the capacity was able to increase without progressing to the next phase thanks to advanced IT logistics. The sixth and final expansion phase will allow the airport to accommodate an annual traffic of 50 million passengers, with the current layout leaving enough space for five more terminals to be added. As such, the parallel runway system currently in place has been designed to accommodate flight traffic with this high equivalent annual passenger load upon completion of the final expansion phase. The main terminal building handles the all intra-Schengen flights, as well as several non-Schengen flights. All of the airport's 144 check-in desks are located in the Main Terminal and it has three separate levels, one for arrivals, one for departures and a food court level complete with a view of the eastern runway. Finally, the terminal is equipped with fourteen jet bridges and eleven belt conveyors for luggage. Hall A is used for flights to Non-schengen countries and Non-European countries. Hall B handles flights to Intra-schengen countries as well as domestic services. In March 2018, the Athens International Airport issued a tender for its first physical expansion, concerning the south wings of the main terminal. The tender called for a building expansion with a total area of approximately 14,950 square meters over five levels (levels 0 to 4). The construction company to build the expansion has been awarded in summer 2018 and the project is scheduled to be completed by mid-2019. It will add 18 more counter check-in decks as well as additional space for arrivals, departures, security and automated control gates, it will also add expanded shopping area and new lounges by mid-2020. The satellite terminal has two levels, one for arrivals and the other for departures. It is easily accessible through an underground link complete with moving walkways. The terminal is equipped with ten jet bridges and is capable of handling annual traffic of six million passengers. In recent years its parking stands were utilized for long term storage of airliners, specifically two ex-Olympic Airways Airbus A340-300s (both aircraft were transferred to its new owner in February 2017) and a Boeing 767-300ER of defunct Greek start-up carrier SkyGreece Airlines. However, as of June 2017, the parking space of the satellite terminal is in full use for both Schengen and non-Schengen area flights and to accommodate increased traffic. From June 2017 Ryanair, Easyjet, Vueling and Eurowings are some of airlines that are using it. On 24 May 2018, the Satellite Terminal officially restarted full operations. The airlines using it are Ryanair, Easyjet, Vueling, Eurowings, Norwegian, Transavia and Transavia France, TUIfly Belgium, Brussels Airlines, Aer Lingus, Air Transat and Scoot. Athens International Airport is the largest and busiest airport in Greece. By the end of 2018, it was the 27th busiest airport in Europe handling a total traffic of 24,13 million passengers. The airport is accessible by the Attiki Odos toll highway from the centre and northern Athens, Varis-Koropiou Avenue from the western part, Laurio Ave. from the South, and Spata-Loutsa Avenue from the East. A variety of parking options are available on site at the airport in three different parking lots. Located at the arrivals level, opposite the airport terminal, the airport offers short-term parking for up to five hours with 1,357 parking spaces available in lots P1 and P2. Long-term parking is located across the airport's main access road (Attiki Odos) with 5,802 parking spaces in lot P3. A free shuttle bus is available to transport passengers, while the lots are also accessible by foot to the terminal. Premium valet service is also offered at the Departures level by Entrance 3. Taxis are available at the designated Taxi waiting area located by exit 3 of the arrivals level. Limousine service is also available upon request by the inner curbside of the arrivals level between exits 3 and 4. Four bus lines (X93, X95, X96, X97) connect directly to the Athens greater area, the intercity bus stations (KTEL Kifissos Bus Terminal and Liosion bus terminal) and Piraeus. Buses disembark passengers at the departures level and depart from the arrivals level between exits 4 and 5. Regional bus services by KTEL Express operate to the airport, currently connecting the airport to Rafina, Markopoulo, Lavrio, Kalyvia and Keratea. Aegean Airlines and Olympic Air have their head office in Building 57 on the airport property. Olympic Air also has offices in Building 53A. The Greek fast food company Goody's S.A. has its head office in Building 14B. On 14 August 2005, Helios Airways Flight 522, a Boeing 737 was a scheduled passenger flight of Helios Airways that crashed into mountain north of Marathon and Varnavas 40 km from Athens. All 115 passengers and 6 crew on board the aircraft were killed. With 121 fatalities. This is the deadliest aviation disaster in Greek history. ^ a b c d e "ATHENS INTERNATIONAL AIRPORT "EL.VENIZELOS"". aia.gr. Retrieved 7 May 2015. ^ "Airports Council International Europe". Aci-europe.org. Retrieved 2015-03-15. ^ "The Airport Company". Retrieved 4 January 2016. ^ "Copelouzos Group – Athens International Airport". Retrieved 4 January 2016. ^ "Hochtief sells airport unit to Canada's PSP Investments for $1.4 billion". Retrieved 4 January 2016. ^ a b c d e Dixon, Tony (February 2010). "Athens International Airport" (PDF). Airliner World. Athens, Greece: Key Publishing. pp. 91–92, 95–96. Retrieved 30 January 2016. ^ a b c "Athens International Airport: Diversion airport for A380 flight" (Press release). Athens International Airport. 17 October 2007. Archived from the original on 19 February 2008. Retrieved 6 February 2008. On the occasion of the delivery of the first Airbus A380 for commercial services, Athens International Airport (AIA) announces that Airbus, Singapore Airlines, Emirates and Qantas have identified AIA as an en-route alternate airport for an A380 diversion. ^ "Στο "Ελευθέριος Βενιζέλος" το μεγαλύτερο και πιο χλιδάτο αεροπλάνο του κόσμου [εικόνες]". iefimerida.gr. ^ Athens airport: A Greek island. The Economist (10 June 2013). Retrieved on 20 August 2013. ^ "Gulf Air Resumes Athens Service from mid-June 2014". Airlineroute.net. 2014-04-11. Retrieved 2015-03-14. ^ "Singapore Airlines Resumes Athens Service June – Oct 2014". Airlineroute.net. 2013-10-02. Retrieved 2015-03-14. ^ "ETIHAD Boosts Athens Frequencies from July 2014". Airlineroute.net. 2014-03-28. Retrieved 2015-03-14. ^ "QATAR Airways Increases Athens Capacity from late-March 2014". Airlineroute.net. 2014-02-04. Retrieved 2015-03-14. ^ "Emirates S14 Operation Changes as of 03MAR14". Airlineroute.net. 2014-03-03. Retrieved 2015-03-14. ^ "AIA "El.Venizelos" Passenger Traffic Development 2015" (PDF). aia.gr. Retrieved 7 January 2016. ^ "AIA "El.Venizelos" Aircraft Movements Development 2015" (PDF). aia.gr. Retrieved 7 January 2016. ^ "AIA "El.Venizelos" Passenger Traffic Development 2016" (PDF). aia.gr. Retrieved 5 January 2017. ^ "AIA "El.Venizelos" Passenger Traffic Development 2017" (PDF). aia.gr. Retrieved 4 January 2018. ^ "AIA "El.Venizelos" Passenger Traffic Development 2018" (PDF). aia.gr. Retrieved 7 January 2019. ^ "Emirates Airlines adds A380 Athens service in June 2018". tornosnews.gr. Retrieved 15 July 2018. ^ "Airbus A380: Στο "Ελ. Βενιζέλος" ο "βασιλιάς των αιθέρων" (greek)". kathimerini.gr. Retrieved 15 July 2018. ^ a b c Bates, Joe. "Positive Thinking" (PDF). Airport World. Airports Council International – aci.aero. 14 (1). ^ "AIA "El.Venizelos" Current Tenders". aia.gr. Retrieved 22 March 2018. ^ Bosnian, Flying (29 August 2018). "Bosnia and Herzegovina aviation news: ✈Aegan Airlines to launch Athens-Sarajevo flights next June". ^ Ltd. 2019, UBM (UK). "Aegean Airlines adds new North Africa routes in S19". Routesonline. ^ 2018, UBM (UK) Ltd. "Air Europa schedules seasonal European routes in S19". ^ Ltd. 2019, UBM (UK). "Alitalia expands Milan Malpensa network July – Oct 2018". Routesonline. ^ "American Airlines Expands European Footprint and Modifies Asia Service". news.aa.com. ^ Mutzabaugh, Ben (15 February 2019). "Norwegian Air adds new Athens, Barcelona routes; fares from $159". USA Today. Gannett Satellite Information Network, LLC. Retrieved 15 February 2019. ^ Ltd. 2019, UBM (UK). "Oman Air adds Athens service from June 2019". Routesonline. ^ "Ryanair Launches 3 New Tel Aviv Routes to Athens, Bucharest & Sofia - Ryanair's Corporate Website". ^ Ltd. 2019, UBM (UK). "Saudia files proposed Riyadh – Athens schedule from June 2019". Routesonline. ^ "VOLOTEA - Cheap flights, offers and plane tickets to Europe". Volotea. 11 January 2019. ^ a b c d "Aerostat Handbook 2017". Athens International Airport. Retrieved 8 July 2018. ^ "Metro". Athens International Airport. Archived from the original on 12 January 2010. Retrieved 15 January 2010. ^ "Short Term Parking (P1 & P2)". Athens International Airport. Archived from the original on 25 December 2009. Retrieved 15 January 2010. ^ "Long Term Parking (P3)". Athens International Airport. Archived from the original on 3 January 2010. Retrieved 15 January 2010. ^ "Executive Valet Parking". Athens International Airport. Retrieved 15 January 2010. ^ a b "Taxi & Limo Service". Athens International Airport. Archived from the original on 30 January 2010. Retrieved 15 January 2010. ^ "Γραμμές Αεροδρoμίου". Oasa.gr. Retrieved 2015-03-14. ^ a b c "Bus Services". Athens International Airport. Retrieved 15 January 2010. ^ "Travelair Club / Partners Terms and Conditions." (Archive) Olympic Air. Retrieved on 6 April 2013. Under "Delta Air Lines" tab: "It is clarified that, boarding pass as well as original ticket must be forwarded as evidence to the following mail address: Olympic Air, Travelair Club department, Athens International Airport, Building 57, 190 19, Spata, Greece." Greek (Archive): "Olympic Air, Τμήμα Travelair Club, Διεθνής αερολιμένας Αθηνών, Κτίριο 57, Τ.Κ. 190 19, Σπάτα"
^ "Quarterly Edition of Olympic Air January 2013." (Archive) Olympic Air. p. 4. "OLYMPIC ON AIR Periodic Publication for Olympic Air ADDRESS Athens International Airport "Eleftherios Venizelos", building 53Α, 19019 Spata-Artemida Attikis, T/ +30 210 3550500, F/ 210 3550632" – Greek: "OLYMPIC ON AIR Περιοδική έκδοση για την Olympic Air id∆ΙΕΥ-ΘΥΝΣΗ Διεθνής Αερολιμένας Αθηνών "Ελευθέριος Βενιζέλος", κτήριο 53Α, Τ.Κ. 19019 Σπάτα-Αρτέμιδα Αττικής, T/ 210 3550500, F/ 210 3550632"
^ "Contact" (Archive). Vivartia. Retrieved on 6 June 2014. "GOODY’S S.A. – everest A.E. International Airport Eleftherios Venizelos Building 14B, 19019 – Spata – Attica" – Address in Greek (Archive): "GOODY’S A.E. - everest A.E. Διεθνής Αερολιμένας Αθηνών "Ελ. Βενιζέλος" Κτίριο 14B, 19019 – Σπάτα Αττικής"
^ a b "airport official web site". "2nd place in Europe and 3rd place in the world for 2001 in the main category of "Overall Passenger Satisfaction" for airports handling up to 15 million passengers annually." ^ a b "airport official web site". "In the airport size category up to 15 million passengers per annum, "Eleftherios Venizelos" moved up to the 1st position in Europe, but also to the 1st position in the world, according to the annual results of IATA's independent survey "Global Airport Monitor" for 2002." ^ "airport official web site". "During the proceedings of the 8th World Route Development Forum "Routes, Athens 2002", the airlines declared AIA the best airport in the world (in the 5 – 15 million passenger range) for its effectiveness in strategic marketing schemes for the development of new routes." ^ "airport official web site". "In addition, the Athens airport marketing team was granted a special merit award for its efficiency in coping with the major challenges confronting the airport since its opening in March 2001." ^ "airport official web site". "Athens International Airport "Eleftherios Venizelos" was the first European airport to receive the "Commitment to Business Excellence" award by the European Foundation for Quality Management (E.F.Q.M.). This foundation, endorsed by the European Commission, aims to the advancement of Quality Management on behalf of European enterprises. By this distinction, AIA's Information Technology and Telecommunications department was certified for the Company's commitment to business excellence as well as to the development – implementation of Quality Management methods towards the optimization of services for the airport's commercial customers and passengers." ^ "airport official web site". "Athens International Airport has been honoured with the "Recognised for Excellence" Award of the European Foundation for Quality Management (E.F.Q.M. ), acknowledging the level of business excellence and the quality of services of the Airport’s Information Technology & Telecommunications Department." ^ "airport official web site". "In recognition of its contribution to the aviation industry and airline support, AIA received the 2003 Eagle Award of the International Air Transport Association (IATA)." ^ a b "airport official web site". "According to the results of "Global Airport Monitor", the annual independent survey by the International Air Transport Association (IATA) for 2003, "Eleftherios Venizelos" Airport won, for the second year in succession, 2nd place in Europe for "Overall Passenger Satisfaction" regardless of airport size, and 2nd place in the world." ^ "airport official web site". "AIA was honoured with a special award for its significant activity in the field of human resources training and development, during the 6th Human Resources Symposium organized by KPMG, a leading business consulting firm." ^ "airport official web site". "The successful implementation of its innovative business scheme earned AIA the title of the "European Airport of the Year 2004", granted annually by the British Institute of Transport Management (ITM)." ^ a b "airport official web site". "For 2004, the International Aviation Community conferred the following distinctions on AIA: 2nd place in the world (airport size category 5 -15 million per annum), and 3rd place in Europe regardless of airport size category, in the "Overall Passenger Satisfaction" category." ^ "airport official web site". "AIA's Corporate Services Division has been presented with the "Commitment to Excellence" Distinction from the European Foundation Quality Management (E.F.Q.M.) in acknowledgement of its business level and service quality with regard to corporate human resources." ^ "airport official web site". "During a special award ceremony, AIA’s Internal Audit Department was honoured by the Hellenic Institute of Internal Auditors (HIIA) with the "Recognition of Commitment" (ROC) for 2004 for demonstrating Professional Excellence, Quality and Accomplishment." ^ "airport official web site". "Award in recognition of AIA's Energy and Environmental contribution. Athens International Airport is the first company in Greece to receive the European Commission’s GreenLight Award for the development of a series of energy-efficient activities in lighting with the purpose of reducing emissions that contribute to the greenhouse effect." ^ "Athens International Airport – Environment". Aia.gr. Retrieved 2015-03-15. ^ "airport official web site". "The Airlines awarded Athens International Airport top marks for its support in route development. During the annual airport marketing awards ceremony ("OAG Airport Marketing Awards 2005"), attended by 1,700 delegates and 300 airlines from all over the world, the airport was acclaimed by the international aviation community as the top-ranking airport worldwide in its category (10 – 25 million passengers) for its airline support programme and contribution to route development." ^ a b c "Airport of the Year – Regional Results". Skytrax. www.worldairportawards.com. 2006. Archived from the original on 12 June 2007. Retrieved 3 August 2007. ^ "airport official web site". "Thanks to the support of the airlines, its major partners, AIA came out top of the list at "Routes", the annual airline-airport summit meeting. It received the OAG Airport Marketing Award for its airline development programme in the 10-25 million passenger bracket." ^ "airport official web site". "AIA was ranked second by the Air Transport Society (ATRS) following the 10th ATRS Conference in Nagoya, Japan." ^ "airport official web site". "AIA was honoured with the most prestigious international distinction in cargo air transport. The distinction was conferred at the "Cargo Airline of the Year" award ceremony, an annual event jointly organized by "Air Cargo News" Magazine and Airports Council International (ACI). AIA received international acclaim in the category of 100 – 500,000 metric tones annually in recognition of its successful programme in cargo development and overall contribution to the field over the last five years." ^ "airport official web site". "For the third consecutive year, Athens International Airport’s airline-partners rewarded the airport with the 1st OAG Airport Marketing Award 2007 at the 13th World Route Development Forum – "ROUTES 2007" in Stockholm. Praised for "maintaining its Olympic sparkle," AIA was awarded for its airline developmental programme resulting in 2007 to attract 12 new airlines, and add 11 new destinations, to America, Asia and Europe." ^ "airport official web site". "For the fourth consecutive year, Athens International Airport (AIA) won the OAG-Routes Airport Marketing Award for consistently and dynamically supporting airlines’ route development through the airport’s wide-scale, innovative marketing programmes*. AIA received the "OAG-Routes Airport Marketing Award" in the framework of the 14th World Route Development Forum, "ROUTES" (Kuala Lumpur October 12th-14th), this year sharing the 1st place with Brussels Airport, which also excelled for its airport marketing initiatives." ^ a b "airport official web site". "Athens International Airport has been honored with the first prize ‘’Golden Sun’’ during the 2nd Superbrands award ceremony, which took place at the Athens Megaron on 31st of March, 2008. Additionally, Athens International also received the special prize for ‘’Travel Services’’. The Superbrands event was born in Great Britain in 1994–95 and has been spread in more than 75 countries from all around the world. For the first time it was held in Greece in 2005, aiming at promoting branding as well as at rewarding the country’s top brands." ^ "airport official web site". "Further to the remarkable energy savings it achieved in its facilities and buildings, Athens International Airport was honoured with the GreenBuilding Award from the European Commission. The measures implemented, which addressed heating, ventilation, cooling and other building functions, led to significant reductions in energy consumption and consequently the airport's contribution to climate change." ^ a b c "airport official web site". "Athens International Airport’s aia.gr Web Award winner. Excellent evaluation of Athens International Airport’s website (aia.gr) and a pair of "Webbies" awards, in the framework of Flightglobal.com’s "Webbies – Aviation Web Awards 2008". Athens International Airport’s aia.gr was awarded with the bronze award in the "Best Airport Website" category and the silver award in the category "Best Online Innovation", for offering airlines personalized customer communication through the innovative e-tools "Infogate" and "Autopilot", blending market intelligence with e-communication." ^ "airport official web site". "Airlines honour AIA with first place in Europe. Athens International Airport (AIA) is once again the winner of the Routes Airport Marketing Awards* in the Europe category. AIA was awarded in the framework of World ROUTES 2009, the biggest gathering of airports and airlines, held in Beijing, from September 12–15. This time airlines from across the globe distinguished AIA for supporting their route development consistently and dynamically, through the airport’s wide-scale innovative marketing programmes**. During tough economic times, this new distinction has a special significance for Athens International Airport: In 2009, AIA was the only European airport with increased number of frequencies, with its airline marketing programmes having so far brought 12 new airlines to Athens in 2009 and 8 new international destinations." ^ a b "airport official web site". "For a 5th consecutive year, Europe’s airlines awarded Athens International Airport for supporting their route development consistently and dynamically, through the airport’s wide-scale innovative marketing programmes. The best airport marketing award was presented in the framework of the "ROUTES Europe" airline development forum, where AIA also won 1st place in the geographical region "Southern Europe – Mediterranean"." ^ "airport official web site". "Just one year after the first publication, 2board was voted the best airport magazine in the world by UCityguides.com, one of the most dynamic and demanding travel website." ^ "airport official web site". "Athens International Airport, for second consecutive time, has been acknowledged as a Corporate Superbrand and honoured with the first prize in the Category "Travel & Tourism" during the Superbrands award ceremony, which took place at the Athens Megaron on the 20th of April, 2010. The Superbrands event was born in Great Britain in 1994–95 and has been spread in more than 80 countries from all around the world, aiming to promote top corporate and product brands through an evaluation process that combines the opinion of a public survey and of the Superbrands Evaluation Committee. For the first time it was held in Greece in 2005, aiming at promoting branding as well as at rewarding the country’s top brands." ^ "airport official web site". "Athens International Airport was honoured with a significant international distinction in the field of cargo development: voted by cargo airlines from all around the world, AIA came out as winner in its category (100,000 – 499,000 tonnes / Europe), in the framework of the 2010 Air Cargo Excellence Survey, organised by Air Cargo World magazine and announced at the recent IATA World Cargo Symposium held in Vancouver." ^ "airport official web site". "On October 30th in Doha, aviation leaders awarded Athens International Airport (AIA) with the "Airport of the Year 2010" distinction, in recognition of the high quality of services offered to airport passengers and visitors, combined with a strong and competitive business model." ^ "airport official web site". "This year’s World ROUTES, the biggest gathering of airports and airlines (19–21 September 2010, Vancouver) were concluded with another top distinction for Athens International Airport, its seventh award in six years. Airlines from across the globe voted AIA as the 2nd best airport in airline marketing in the European category, for supporting consistently and dynamically their development efforts and programmes." ^ "airport official web site". "Athens International Airport won its 6th Routes award for the financial support and innovative airport marketing programmes offered to airlines. During the "ROUTES Europe" conference that took place in Toulouse during May 9–11, Athens International Airport (AIA) was awarded as the winner in the "Mediterranean-Southern Europe" category." ^ "airport official web site". "In its airport assessment in the highly challenging environment of the air-transport sector, the Institute of Transport Management named Athens International Airport the title of "European Airport of the Year 2011" acknowledging AIA’s high quality customer services and superior design, its awarded marketing programmes, strong -entrepreneurship and corporate social responsibility, even amid the present difficult times for the Greek economy." ^ "airport official web site". "Athens International Airport (AIA) was honoured with a new distinction, for the third consecutive year, at the 10th "Stevie – International Business Awards". AIA received the bronze award in the category "Company of the Year-Transportation", among over 100 companies and organisations of the aviation sector. The "Stevie – International Business Awards" institution aims at honouring and communicating the achievements and contribution of enterprises, organisations and entrepreneurs, to the international business community, the general public and the media. In 2013, enterprises from more than 50 countries participated in the "Stevie – International Business Awards". The awards were presented in a special event in Barcelona, on October 14th." ^ "airport official web site". ""Routes Europe 2013", Europe’s biggest airline and airport networking route development forum, was concluded with one more award for the Athens International Airport, its 12th in 9 years. During the 8th Routes Europe Forum, which was held in Budapest (12–14 May) with the participation of more than 1,000 aviation professionals, Athens International Airport was the award Winner in the 4 – 20 m. passengers category in recognition of its creativity and continuous dynamic support to its airline partners, especially in light of the extremely adverse conditions that the Greek economy is facing. Having received the airlines’ recognition for 9 consecutive years, Athens International Airport (AIA) is the most awarded airport for its airport marketing performance." ^ "Airports Council International – Europe website". ^ "airport official web site". "Athens International Airport receives top European environmental airport award! In honor of its innovative environmental programmes and initiatives, Athens International Airport received the Eco-Innovation Award at the ACI EUROPE Best Airports Awards ceremony at the recent 9th ACI EUROPE/ WORLD Annual Conference & Exhibition in Istanbul. This distinction comes as a significant acknowledgment of the Athens airport’s leading approach to environmental protection. This year's award takes on additional significance during a critical time for the country as well as for the aviation sector, as it reflects AIA’s continuous efforts to deliver environmental management systems that go well beyond regulatory requirements. Specifically, the Athens airport scored highest on criteria addressing environmental awareness, effective management of carbon emissions, and stakeholder engagement." ^ "airport official web site". "The new aia.gr was awarded for its modern design and its user friendly navigation." ^ "airport official web site". "AIA’s innovative B2B Blog, a "portal-lounge" for the daily communication and the provision of information towards its airline partners, received the top distinction in the category "Business to Business", in the framework of the "Webit" Congress." ^ "airport official web site". "A new distinction for the web page of the Athens International Airport: The new aia.gr was awarded for innovation, easy navigation and creative interactivity with the "Golden Ermis" in the "Digital – Travel" category." ^ "airport official web site". "AIA’s web page received another important distinction, the top "Merit" in the framework of EBGE 2014, the Greek Graphic Design and Illustration Awards, in the category webpages / information." ^ "ACI EUROPE Best Airport Award winners for 2014 announced". "This year’s award in the ‘10–25 million passenger’ category went to Athens International Airport. Athens secured this award due to its high economic performance in a very challenging context, its excellent work in redeveloping its traffic base while keeping a strong focus on the quality of service." ^ "Athens International Airport is ΄Airport of the Year΄". "The Athens International Airport ("Eleftherios Venizelos") was named "Airport of the Year" in the 10- to 30-million-passenger category by internationally acclaimed web portal Air Transport News, at an event that took place in Geneva, AMNA reported." ^ "Athens International Airport wins first place at ROUTES Europe Awards 2016". "One of Europe's leading hub, Athens International Airport was announced as the winner in the 4 – 20 Million Passengers category of the Routes Europe edition of the Routes 2016 Marketing Awards..."
^ "ACI Best Airport by Size and Region". ^ "Athens International Airport is Best Airport in Southern Europe". Skytrax. Athens International Airport. 2018. Retrieved 8 July 2018.